I spent the first hour of Stonehearst Asylum frustrated because the twists were so obvious they were even revealed in the poster. Plus, so many movies in the past had already treaded the same territory; from the classic flower power King of Hearts to the abysmal slasher film Don’t Look In The Basement. But director Brad Anderson (Session 9) pulls a major reversal through flaunting a misdirection. Even if 50% of the audience figure out the twist, it’s still a rewarding thriller with a striking visual design and a creepy performance by Sir Ben Kingsley. Based on Edgar Allen Poe’s short story, “The System of Doctor Tarr and Professor Fether,” Anderson’s film delves into duality, particularly showing both the doctors and patients as crazy and cruel. 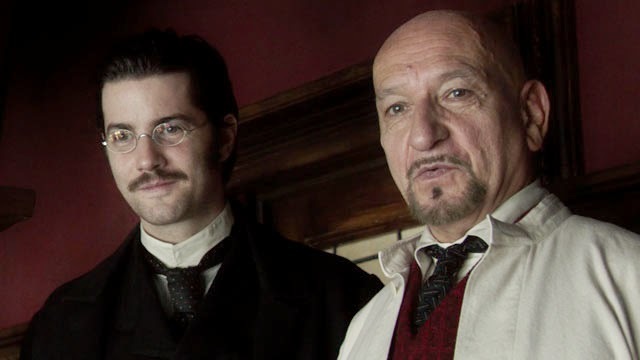 In 19th century Europe, young doctor Edward Newgate (Jim Sturgess, Across the Universe) arrives at the prestigious Stonehearst Asylum to learn from the distinguished doctors. He finds the staff quirky at best. 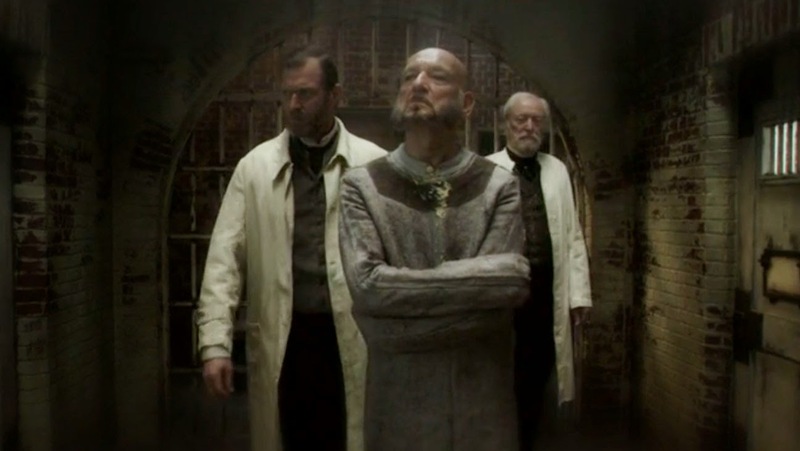 The lead doctor, Silas Lamb (Kingsley) rules over the hospital like a tyrant, with a henchman (David Thewlis). Newgate is weary of his new home but becomes entranced by the ravishing Eliza Graves (Kate Beckinsale). The hospital has a secret locked away; one that reveals Stonehearst’s perverse past. Like the source material, Anderson plays up the darkly comic elements of his tale. He visually presents an ugly world, where it’s unclear who is sane and decent. The doctors are sadists – Brendan Gleeson as a fellow doctor treats a female patient like she’s a rag doll. The doctors use equipment more apropos for The Spanish Inquisition. The motif of chess highlights the one-upmanship between the dictatorial Lamb and the equally volatile Dr. Salt (Michael Caine). Lamb and Salt are two sides of the coin and instead of Newgate being caught between the angel and the devil; he has two devils vying for power. Visually, Anderson has achieved a gothic nightmare. In the opening scene, the hospital emerges like a haunted house on a hill engulfed by the fog. To hammer home the dread, Anderson has Newgate arrive during an electrical storm, with lightning flashing through the murky sky and pitch black ravens flying past the cast iron gate. The rooms are moodily lit with fireplaces and gas lamps giving the hospital a shadowed environment. The camera is often obfuscated, shooting the characters through bars or shutters. Kingsley and Caine, who haven’t shared a screen since the Sherlock Holmes spoof Without a Clue (1988) have delectable chemistry. It’s shocking the two don’t perform more often. For most of the film, the story has them separated, but once they’re in a room together, they attack like two pit-bulls after a ham steak. Both find the absurdist comedy in their lines. Kingsley swats his cigar around like it's a deadly saber. Sturgess is fine as the befuddled doctor in over his head. Beckinsale is a lovely enough presence that it’s clear why she has bewitched Newgate so. 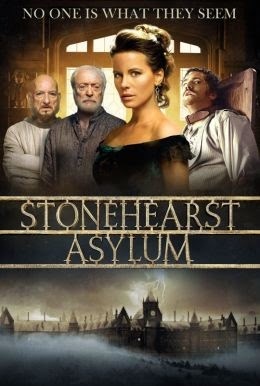 A slightly campy, atmospheric thriller, Stonehearst Asylum is reminiscent of the Hammer horror films, not just the Gothic monster movies starring Peter Cushing and Christopher Lee but also the Hitchcockian thrillers like Scream of Fear starring Susan Strasberg, where everyone’s plotting against each other and the audience can’t believe anything they see or hear.